This is a past tour. For the current tour, please see the 2019 Military Convoy Centennial Tour. Registration is now closed. We have 270 people traveling in 140 vehicles, from 28 U.S. states and from Australia, Canada, England, Germany, Norway and Russia. 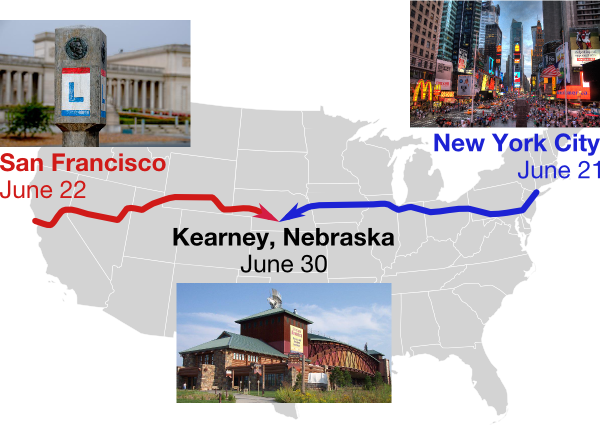 Join fellow historians and tourists for the Official Lincoln Highway Centennial Tours, headed for Kearney, Nebraska from each coast, for the centennial of America’s first paved transcontinental road: the Lincoln Highway. Antique cars, Classics, muscle cars, ’50s cars, trucks, motorcycles, street rods, and modern cars are welcome to participate. You will travel the original alignments of the Lincoln Highway covering many miles of two-lane history, four-lane progress, and even gravel scenic beauty. Travel from America’s urban centers, through pastoral farm lands, over breathtaking mountains and rolling prairies. Travelers from the East will start at Times Square, the heart of America’s most vibrant city. You will travel through ivy-covered college towns such as Princeton, New Jersey, and the Amish country of Pennsylvania. From Pittsburgh’s steel and beer brewing industrial history, you will travel through Ohio’s diverse agricultural and commercial mix. Indiana takes you through more Amish farm land, South Bend’s Notre Dame and automotive history and on to Illinois. From Illinois you will travel to Iowa’s farmland across the Mississippi River into the prairies of Nebraska and on to the Centennial celebration in Kearney at the Great Platte River Arch Museum. Entry fees have been kept low to permit participation for as much of the tour as you wish. Miles per day are kept to an average of 240 per day to permit time to stop for tourist attractions and the pace of the older cars. Discounted hotel rates and automated booking services will be provided by Holiday Inn and its parent company InterContinental Hotels, the official Lincoln Highway hotel sponsor. Discounted vehicle shipping will be arranged for those who wish to ship cars home after the tour to Nebraska or to their chosen starting point. You can directly contact Passport Transport, the official carriers of the LHA Tours. Call John Scharff toll free at (800) 325-4267 or email him at johns@passporttransport.com. For tour information and booking, contact Rosemary Rubin at (330) 418-3980. Copyright © 1999–2018 by the Lincoln Highway Association. All rights reserved.